‘So you see, Miss, we’re doing our best, afore she comes, to—’ At this moment Five, who had been anxiously looking across the garden, called out `The Queen! The Queen!’ and the three gardeners instantly threw themselves flat upon their faces. There was a sound of many footsteps, and Alice looked round, eager to see the Queen. The English are a martial race and yet, they are neither a hostile nor a warlike people. True, their history revolves around preparation for war and honoring a disciplined military tradition but they have mostly used their force for either global balance of power or enforcing lucrative trade policies. In any case, they have been far more at home using diplomacy and pecuniary incentives to influence world order. This may be why we enjoy the English gentleman as an image. He uses his intellect in parliament; language and the lilt of his voice are his finest weapons. He discusses, he negotiates but force is unthinkable except as a last resort. He is the ultimate executive and his power emanates not from the barrel of a gun but from controlled or restrained movements. Because this restraint is both unnatural and hard to teach, when accomplished, it is awe inspiring. The qualities and principles of restraint are echoed visibly by choice of necktie. Empires rise and crumble but the Englishman never deviates from jacket and tie; restraint, restraint, restraint. And this power through restraint, compressed into the small bit of silk that comprises the necktie acts like a standard of influence telling the world what “regiment” he belongs too and how he conducts himself and ultimately them. In their own words the traditions and trends that the English tie industry sees in their country. Ties are woven, rarely printed, never cartoon characters. Regimental stripes are very popular at the moment. Regimental stripes but not from actual regiments. As the club tie specialists in the UK, they have the archives of all the regiments and clubs so they can easily avoid offending any organization. The neckties have a lightly pressed lining which leaves rounded edges rather than hard creased edges. This produces a fuller knot and dimple. It looks more luxurious this way and imparts a sense of prosperity to the observer. They sell about half a million ties a year mostly in England, so they’re doing something right. Harvie and Hudson says that for neckties, dots should be no larger in diameter than a centimeter and often half that size. Navy and pink, white, yellow, red, or blue dots are most popular, and bright red with a white or blue dot. The fleur-de-lys or Prince of Wales feathers is an evergreen pattern that never really goes away. 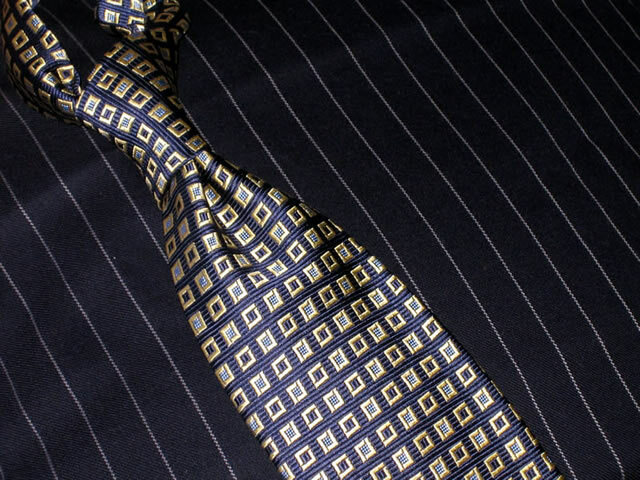 Woven ties usually come in navy with either red, blue, pink, white, yellow, sky blue, aqua or lilac designs on them. Sometimes they will form combinations, red and blue on navy, pink and blue on navy, yellow and blue on navy ad infinitum. 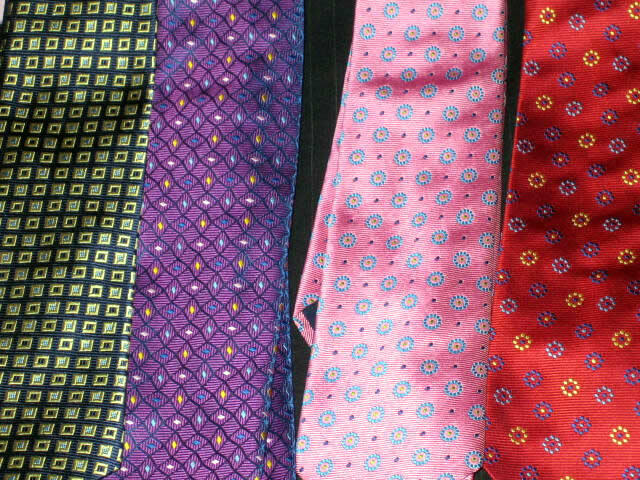 Printed ties in a heavy weight are acceptable with the younger set, while the older men almost always choose woven. The English either choose the most conservative ties imaginable or some of the craziest patterns possible. 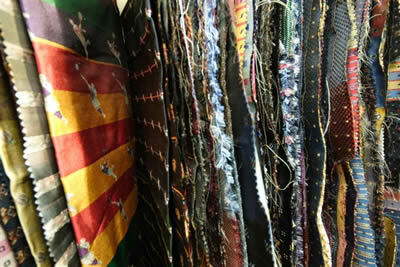 It often seems they are in a race to find ties that fit as many colors on a necktie as possible without clashing. There exists nothing in between these two extremes. This is quite possibly because the English wore such restrictive ties for so long that they lost their way taste-wise when they felt the need to branch out. Much of what Drakes does is try to find a sophisticated middle ground in tie patterning and coloring that will still embody a distinctive English flavor and tradition. Paisley ties are mostly for the country and unite the subdued elements of the country outfit of tweed jacket and tattersall shirt. Poole carries a selection of ties that it knows will appeal to its English (or anglophile) clientele. The background colors of the silks are mostly a medium navy and a dark red. Wool ties, madder ties, knit ties are all popular. Ties are not mandatory, as they once were, and have been reinvented a bit for survival purposes. They’ve become more colorful and the challenge is to offer this without offending English tastes, and include textured plain ties and semi-plains (small dots and geometric designs). Their ties with a different front and back blade color exemplify the sort of hidden difference the English find attractive. Small neat and small paisley designs go back deeply into the archives. The silk is in a particular type of finish. Vanners make excellent silk for neckties and they buy a lot of fabrics from them. A company called Adamley is used for printed tie fabrics, and Thomas Mason fabrics for shirts (they aren’t owned by the English but still demonstrate English tastes). They make ties with a contrasting rear blade. That achieves two ends (ha-ha) first the tie is something that identifies the wearer of part of a set that shops at this exclusive store and second, the tie has that subtle nuance that can only be glimpsed at certain times which the English find titillating. 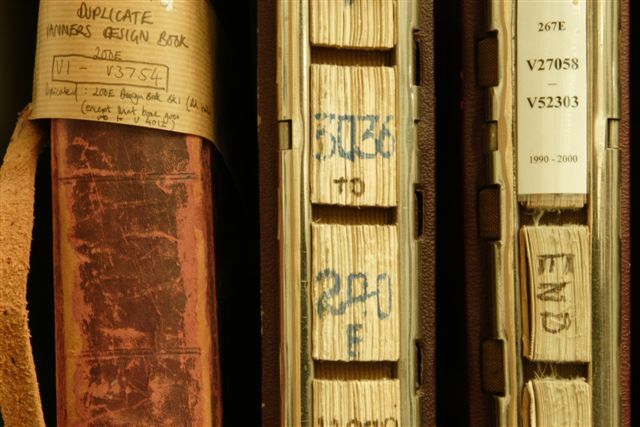 The mill of Vanners hold the secrets of the English art of silk weaving. 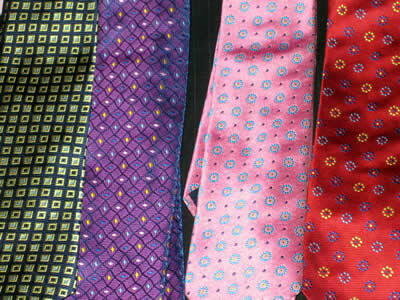 Turnbull make a large selection of ties which are a sort of highly refined City Lad approach. Truthfully, they are also well loved by barristers and bankers, mandarins and the heads of the larger corporations too. Turnbull employs the colors and patterns that the English hold dear in a riot of acceptably native color combinations. 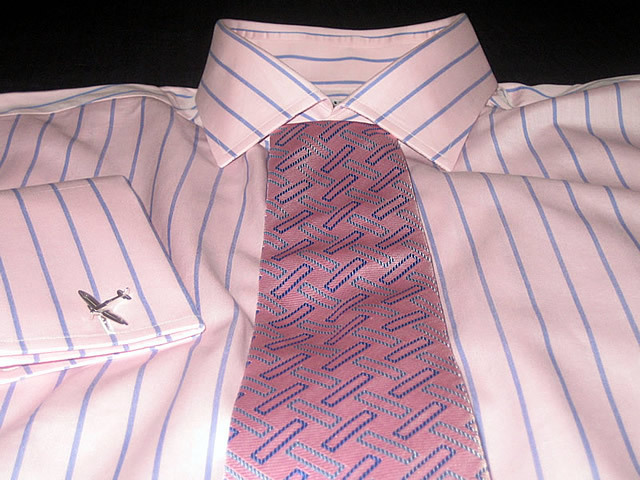 The ties themselves are a brand recognized by most men in England and carry their own unique cachet. Many of them that seem new and fresh are designs harkening back to the Swinging London of Carnaby Street. There is a huge trend toward woven ties in England. Red is popular, but the national passion (which is rather cool) is all shades of blue from a royal down to a navy. A navy solid with a herringbone pattern is the one they would stock most to appeal to English sensibilities. One of the traditional ties in England is the regimental tie. The market for regimental ties endures globally, even if it has cooled a bit in Britain. Quirky color combinations are acceptable. The regimental tie industry is based on two simple striped patterns: the Guards stripe, evenly spaced inch wide stripes of color one and color two, and the club stripe, composed of a quarter inch stripe on a dark ground such as the “Old Etonian,” which has a navy blue ground with a sky stripe. It should be mentioned that although certain stripes are called club stripes and are used by clubs, the actual club tie or heraldic ties are those with small repeating motifs ( a fox head or a rose for example) or escutcheons (School or association coats of arms) on them. There are also grid patterns and geometrics. These are self explanatory. Macclesfield tie patterns are small neat designs sometimes but not always in classic color combinations. And what is a Macclesfield tie pattern exactly? 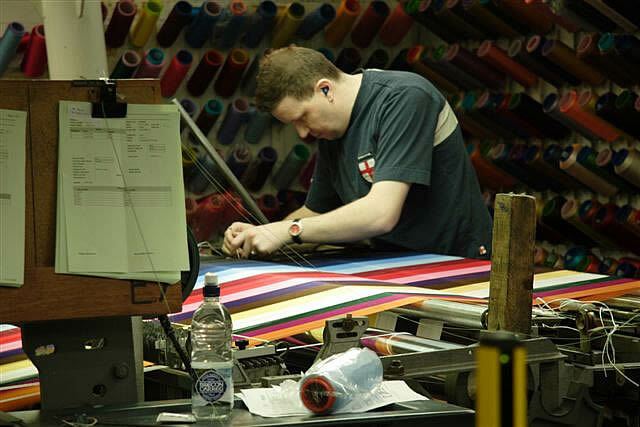 During the first half of the twentieth century, the two powerhouses of English necktie silk weaving were Sudbury in Suffolk, and Macclesfield – both industries being legacies of silk weaving from earlier centuries. During this period jacquard tie designs were either stripes (including regimentals), or small scale jacquards. These jacquards tended to be neat geometrics and very small floral effects – and although they were woven in both locations, Macclesfield became pre-eminent in their production. To this day, therefore, small neat jacquards are still referred to as ‘Macclesfields’, especially when woven in classic colourations. 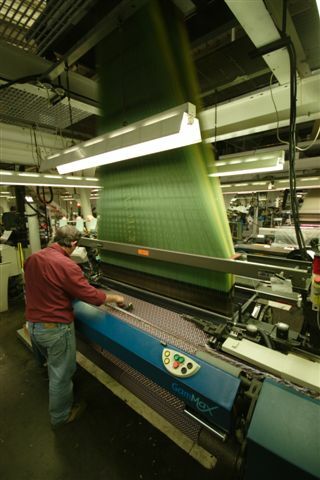 Another typical scene at Vanners where silks undergo a series of treatments before they are woven into patterns. Duchamp and Richard James are two houses that have created a new direction for a certain type of woven and very colorful tie that appeal very much to the English taste. It is difficult to put a busy tie on a busy shirt, but the English will do it. Vanners weave Duchamp’s and Richard James’ tie collections and appreciates each firm’s unique and exciting approach to color and pattern. This enthusiasm translates into a better all-around product because both sides (designer and weaver) participate in the color riot, making these ties uniquely English. They also make the silks for the Turnbull and Asser and the Charles Hill silk ties, which posses a color value that is difficult to achieve elsewhere. The same could be said of the ties carried by Thomas Pink, whose Madison Avenue store is very large and showcases a lot of Vanners’ silk weaving handiwork. The English enjoy color on their ties, even if the background is often dark. Men in England tend toward blue shirts and navy blue ties. Navy background with white or pink or red is a natural design starting point for the English market. Vanners has at least 20 shades of navy from a sub royal blue to a blue/black. Navy background neckties are in such demand in England that they could easily create another 20 shades. 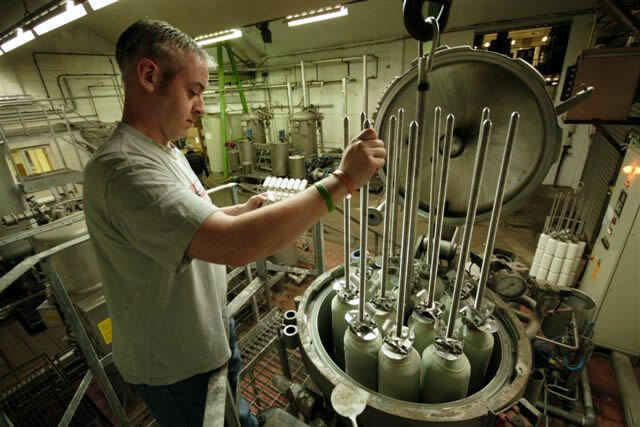 After navy, wine backgrounds are next on the popularity scale, followed by a buff color or a yellow/gold. Beautiful colors are the result of painstaking attention to detail. Vanners’ collective knowledge produce the shades the English find desirable. English men are not afraid to wear pink or orange as a background color or as a highlight. Actually, as Shakespeare’s Herald alluded to in Henry V, Englishmen are not afraid of anything at all. But more to the point, they certainly are not afraid of colors nor do they shy away from clashing tie and shirt. Clashing colors isn’t a concern because the English see it done so often by their men that it has become “classic.” On the upscale websites or in the better English male style catalogs, the designers take great care to match ties to shirts because the rule of thumb is that ties drive shirt sales. It serves to demonstrate an ideal to the English of how colors can work together, even if the combinations work better in theory than in practice. Which is why colors of a certain tonal range can be deliberately intermixed and the result will, at worst, be a sort of quirky personal style. Because the English have such dull weather, they tend to sport brighter colors for accessories; they need to cheer each other up. They don’t wear the wedding ties that Manhattanites wear on a regular basis. They do wear them for weddings in shades of grey and also lilac, blue and pink. More than 50% of the ties sold in the world are bought by women on behalf of men, and so design aesthetics are created with what captures the female eye as well as that of the male. The English put patterns on patterns all the time and they put patterns of tie on same scale patterns of shirt without any regard for the result. Aesthetic objectivity is not something to achieve for an Englishman who can get more points for doing it wrong and thus appearing not to care at all. In America the number one background color is red, followed by black (which the English don’t like much, but this is changing). Americans match their ties to items other than their shirt or with regard to the entire ensemble of suit, shoes, pocket square etc., while the English only match their ties to their shirts. Over the past 5 years their colors have come up in tone. There is greater demand for brighter, cleaner shades than before with firms like Duchamp and Thomas Pink driving an appetite for pure, primary tones of color. The English prefer chunkier, heavier weights with interesting weaves and tie constructions . Texture is important, and stiffer, crisper silks are in ample evidence in the English market in distinction to the softer, gummier, drape-y ones so popular in other markets. Simply hold a skein of English woven silk and you can feel the crisper handle. Why is English silk different? 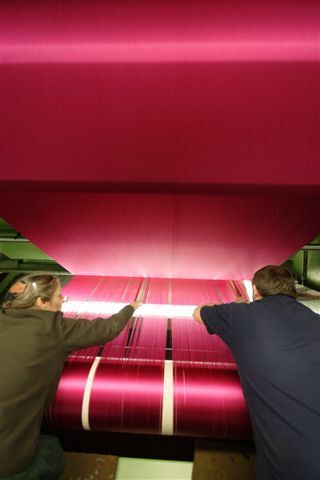 English tie silks are said to have scroop1 , part of the silk weaving and refining process. When made into a necktie, scroop gives off it an almost audible “crunch” as you make a knot. Pattern setting is both a technical and historical art form. As such, Vanners is certainly a British national treasure. The English have a long standing tradition of producing jacquard silk weaves in a large number of variations. In fact, they have developed so many acceptable textured weaves that no man could ever wear them all in a lifetime without being a dedicated clothes horse. This art of jacquard silk weaving explains the English fondness for textures on neckties; even (or especially) on solids. Contrast this against the plain twill solids acceptable in other markets. Skews (color ways for each tie pattern) are needed aplenty for ties in every collection. If a shirt collection features 50-100 different shirt designs, multiply that by 10 for the number of neckties needed to accompany them. Skews or small rectangles of a tie design in different color ways are sewn together into quilts to give a potential customer an idea of how a range will appear. Consumer demand for ties by tends to be voracious. And, creating still more demand, tie designs even for the relatively stable English typically last for only one season and then new patterns are introduced with new color ways. The good news is that Vanners can refer to their vast archival designs both to reintroduce them and to use them as a starting point to design new patterns and color combinations. As always, what’s old is new. Vanners refers to archival books of tie patterns in order to come up with new designs several times a year. Over 100,000 designs reside in Vanners archives, which are catagorized by decade, by pattern and by weave. These are the seeds for any Vanners project. The amount of work necessary to create a given tie collection can be vast, and many of the simple tie patterns that people take for granted required someone at Vanners to set, perfect and put into differing color palettes. Add to this the marketing schedules for father’s day and Valentine’s Day, the tie designers are working round the clock to meet demand. 350 thread count (per inch across the warp) ties exhibit the truly unique, rich quality that Vanners are known for. The warp is the thread on which the fabric is woven; the underlying basis of the design. Generally, the richer the warp, the richer the fabric. And weave settings can make a club stripe in a “fleshier” texture, a satin stripe on a repp ground, a twill stripe on a basket weave ground. Weave settings can also account for more open weaves like grenadine or tighter, crisper weaves like the panama — the number of combinations is seemingly unlimited. Cravats make ties for stores like H. Herzfeld, J. Press, Dege and Skinner, Harvie and Hudson amongst many others. Very English, very knot and dimple friendly in construction. They have been in business for roughly 55 years. Their current proprietor, Mr. Norman, who traces his lineage back to the conquest, is about as English as one could hope for, in the best possible sense. Because he sees trends in selections both in Britain and abroad, I was fortunate enough to hear some of his thoughts on the English preference in neckties. For casual the English gentleman might wear an ascot or cravat under his shirt. However, he would wear a classic tie with a suit. A classic tie is one that no one will find jarring the first time they see it. Small dogstooth or houndstooth checks, a polka dot or a plain tie with texture in the ground are examples. Grenadine ties are very popular in navy, royal, red, cream. Cream ties for a cotton suit in beige with a pale blue shirt and a cream grenadine tie. Not very City, but then Britain is a greater place than just London, and the 2006 summer has been brutal. The English prefer blue followed by burgundy. The blue ties would be dark but not too dark. A fleur de lys tie, navy ground with red, blue, pink, lilac, aqua or gold fleurs is considered quite staid. The pin dot (very small and often closely clustered), the Churchill spot (about the size of a paper hole punch), and the one cent size which is not hugely popular but much more popular in Britain than anywhere else. Neckties in 350 count silk, woven by Vanners to Cravats specifications. They are then made up by Cravats and appear in the very best English men’s shops, such as Harvie and Hudson. The bowtie wearer in England will always be looking for something different. Bow ties tend to be more flamboyant and more eccentric and, once you dare to wear a bow in England and outside the Clubs — you would be hard pressed to find a bowtie wearer in London — absolutely anything goes. Much more common in England is the black tie for evening. Black ground ties are not popular in England but navy, burgundy and purple backgrounds are popular. Pink, purple, gunmetal grey and even a blue-grey will serve as background colors but it is navy with highlight colors white, silver, pink, lilac, purple, red, yellow, sky and aqua that is king in England. The pig motif represents the male chauvinist cult which Englishman enjoy being a part of. Made up for Ede and Ravenscroft, a City of London based shop: a checker board motif a quarter inch across, which are even worn by the very straight and narrow London barristers, solicitors and judges in alternating silver and colored checks. Although the origin of the checkerboard motif is uncertain it is very English going back to patterns in Celtic textiles in pre-roman conquest days. The English tie business is 90% woven and the rest is bought by foreign passport holders. The English wear blue or blue pattern shirts and sterling cufflinks which explains their predilection for navy or blue ground ties. They do a 50 and 36 oz printed tie, and of course they make a meal of the Vanners 350 thread count wovens which the English go mad for. They make up English ancient madder ties, wool challis ties (popular in the States because we think the English wear them, which they really don’t), Mogador, satins, repps, spots, paisleys, neats, printed to name a few. They get many of their silks designed and woven by Vanners, a firm that understands the English cultural approach to silk color, texture, pattern and weight. Designed by, for and made in England; it can’t get much more authentic than that. Another 350 count tie woven by Vanners, made by Cravats and worn by London’s sartorial elite. The English like dense woven ties with texture and just the proper glint to the silk. The ties are between 145 and 147 cms in length and the width of the blade is between 9.5 and 9 cms. Anything goes for bowties, absolutely anything. You’re meant to be an eccentric if you wear a bowtie and thus the regular necktie guidelines do not apply. Barristers and medical consultants are often the most influenced by this look. Additionally, the most tedious and straight laced occupations generally have the loudest bowties which is why some of the nicest are produced by Duchamp, Turnbull and Asser and Paul Smith. I think it not unlikely that the English would use Charvet bowties an awful lot as well. Remember that the English like simplicity. This is a baseline but it is not where the entire population resides with regard to tie selection because the English also like color. At its most callow and yet culturally acceptable level, the English will place a blue tie upon a blue striped shirt and a purple tie upon a lilac striped shirt. That’s not too exciting but it is very English. At a step above this is a level of Englishman who will only place the blue tie on the lilac striped shirt and the purple tie on the blue striped shirt. This level of Englishman will never place like color tie on like color shirt and would tell you that the matched color level is indicative of a less sophisticated Englishman. However, they will still accept the practice as comfortably, if unfortunately English. Although the English like contrast with the tie generally darker than the shirt, there are exceptions like the example above. There are no hard and fast rules about this and each combination must be examined on a case by case basis. This is the Harvie and Hudson look with a smart City twist. Another type of Englishman revels in the clash of colors. This is the approach that he just selected whatever tie was at hand and threw it on the shirt, irrespective of its complimentary values. Buying whatever shirts and ties you like separately enhances this look which it can be said no other jacket and tie wearing set do with as much aplomb. The English love to plan it all to look like they got it wrong and still have it look “English”. These men will place their regimental or club tie on a shirt regardless of the colors or pair a blue and pink checkered tie on a blue shirt with a red highlight — close but no cigar, and yet one of the crowd. There is yet another level that may introduce colors that neither compliment or match but contrast and also have accent or background colors that may be a bit renegade or naughty such as green, brown or orange. If this is planned with enough cleverness, the discordance is a sign of even more sophistication through the pose of “I don’t care”. This is the aristocratic stance that the English still find to be a sign of importance. However while they may be seen to be violating color or pattern taboos, they are choosing them with some care and through the eyes of a greater England. Only the English can make the right (but wrong) tie choices and still be viewed as English by their peers. An American doing so would be spotted at once. Whatever type of Englishman you observe he will have matched or not matched his tie only to his shirt without regard to anything else in his outfit such as jacket, pants, socks or pocket square. Ties for the English serve an interesting duality. On the one hand, they are mere napkins which protect the shirt. Well-to-do Englishmen will buy ties in polyester because they are washable! Something an American of the same background would find hard to fathom. On the other hand, there are messages sent by the choice of tie. Different sorts of Englishmen choose different colors and patterns and within each clique there further exists a hierarchy of who everyone is according to the choice of their tie. There is thus their group and our group, but then there are also judgments made about everyone within a given group. The serious man picks the darker, smaller pattern, the womanizer may choose louder ones, and the thug may pick a different sort of tie again, but all bought from the same shop. I recall old movies set in the colonial era where it was a disgrace for the British regiment to lose their ensign or even let the flag touch the ground, embodying as it did regiment, queen and country. Similarly, the necktie announces who the wearer is and the position he holds in the regiment that is England which as a consequence sets a nation’s standards. 1 the crisp rustle of silk or a similar fabric.